How about the 2015 vintage in Burgundy? Burgundy in 2015 enjoyed an early, rapid flowering of the vines, then superb levels of sunshine during June and July. Temperatures throughout the summer were above normal, with rainfall lower than usual, so there were almost no threats from disease. Grapes were able to ripen in magnificent conditions. A heat wave in early July and refreshing rains in August allowed sugars to climb and tannins to be fully ripened, while acidities were retained. Picking began on 2nd September, in ideal, dry conditions. The 2015 vintage shows every sign of being superb, with the thrilling prospect of producing sumptuous whites and fascinating reds which Burgundy-lovers will be able to savour in the short-, medium- and definitely the long-term, for the greatest Cuvées! The commune of Beaune (12 square miles) is one of the largest in the Côte d'Or. The reds are light and approachable, they show a complex character of red fruits and firm but reserved tannins. 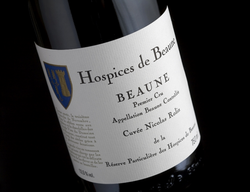 Hospices de Beaune Premier Crus are earthy and exotically rich, with a clear need for aging. The wine should develop well for 15 years. It is the largest of Morey-St-Denis' Grands Crus. The style is rich and concentrated, with a classically dry tinge in the first few years. Flavors are incredible, with dark fruit usually superseding the red cherry and raspberry fruit. But these wines are essentially soil-driven, with exciting notions of herbs, pepper, and spice overhung by an intense smoke component. This amazing character, which is almost exotically tinted is hard to find anywhere else. They would age more than 20 years. Corton AOC is the only Grand Cru for red Pinot Noir in the Côte de Beaune. The wines combine power with luscious aromas and flavors, making for some of the best Pinot. The great structure and power of the wine is undoubted. Due to the firm, high-tannin style of the wine, it usually needs 20 years or more of aging, and can be among the most long-lasting of all Burgundies. The Échezeaux vineyard, lying within the village of Flagey-Échezeaux, is one of the most productive Grands Crus and its location near Vosne-Romanée makes it very desirable. Échezeaux makes wine of a light, somewhat feminine style, boasting pure cherry and raspberry flavors, with a soft texture. Oak overtones often enter into the wine, making for spice flavors and a creamy texture. It should last 20 years, like any Grand Cru Burgundy, and they often peak after 10-15 years. Mazis-Chambertin is a Grand Cru vineyard and corresponding appellation of the Côte-de-Nuits in Burgundy. 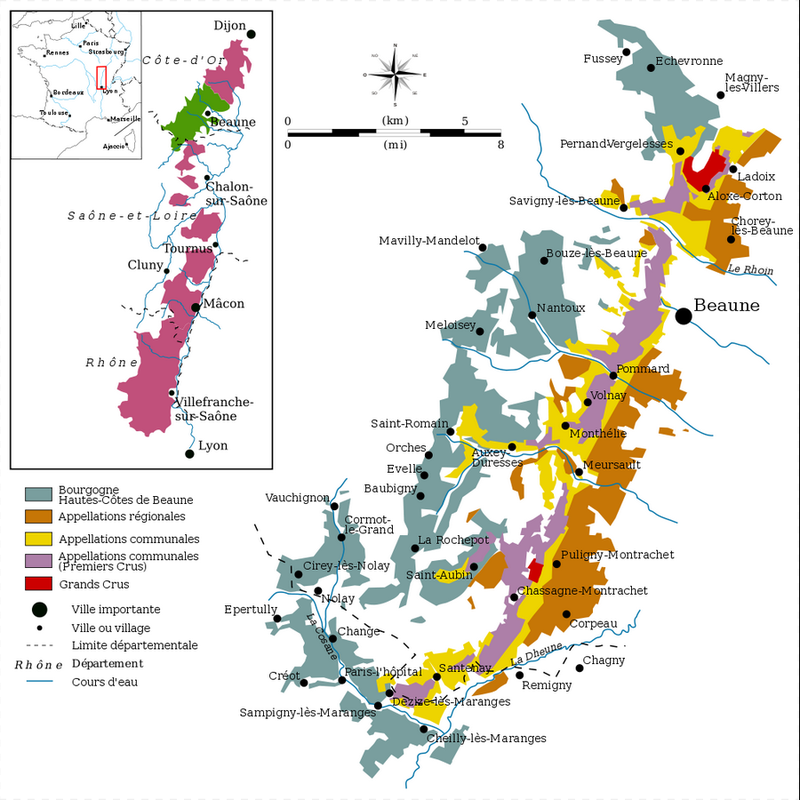 The climat is located on the upper slopes of Gevrey-Chambertin's Grand Cru belt. The style is generally an earthy one, with wild flavors of smoked, roasted game and underbrush framed by a lively core of minerals. These wines will benefit from a decade of cellaring. Pernand-Vergelesses is one of the three Côte de Beaune villages that makes up the Corton hill. The Corton hill is home to 3 Grands Crus and hundreds of the most prestigious wines in the world. The reds are fairly elegant and boast great balance. Pommard makes some of the most tannic and full-bodied wines from the Cote d'Or. Pommard's intense, firm wines contrast directly with the soft, feminine wines of the competing Volnay, which lies slightly southwest of Pommard. Like most of the best red Burgundies, they need a good amount of time to mature. They can easily last 20-25 years before the tannins and fruit start to fade away. A typical Santenay red wine is more deeply colored than those from further north, but still retains the dark cherry color so characteristic of red Burgundy. The aromas are of licorice, red berries and violets, with the most-perfumed examples also showing notes of rose petals. Premier Cru level red Savigny-les-Beaune have a very well-rounded, substantially complex character. Red fruits, especially cherry, combine with earthy flavors to make a moderately deep, firm but sweetly tinged wine. The Premier Cru wines as offer today, offer more in the way of complexity and can age a good 15 years. Towards the north of the Côte de Beaune, near Pommard, there is a village that has become famous for a red wine style dramatically different from Pommard, yet on the same prestigious level. The ultra-elegant, softly styled Volnay is among the most elegant of Côte d'Or reds. The flavors are the usual Pinot Noir notes of earth and soil, wild and sometimes exotic plum, cherry, raspberry, and blackberry flavors, along with less noticeable tinges of smoke, leather and chocolate. Volnay 1er Crus can last for 10-15 easily. It is one of five Grand Cru climats located in a cluster around the Mont-Rachet hill in Burgundy. Many critics might describe Bâtard-Montrachet wines as "perfect." And indeed, several of them do approach the perfect balance between fruit and minerals, as well as between power and elegance. They are often regarded as the ultimate expression of the Chardonnay grape variety. This great Bâtard-Montrachet will still be developing after 10 years and can be cellared for 20! Outside the Côte d'Or, the main outpost for white Burgundy is in the very north of Burgundy. The Chablis 1er Cru wines show a citrussy character of lemon, lime, and often even kinds of grapefruit, with sometimes peach, pineapple, and more exotic melon and pear. Acidity is usually high to keep the fruit clear and vibrant. Premiers Crus, might be left to rest for 5 years. It makes Chardonnay of a round, balanced, approachable nature. They tend to follow a general earthy characteristic, with those classic white Burgundy undertones of nuts, butter, and richness. You are safe to age your Corton-Charlemagne for 15-20 years, and most likely more flavors will be gained in this span of time than will be lost. They offer amazingly rich, buttery layered flavors, more nutty than fruity. The creamy characteristic is brought on by the long oak aging that is a hallmark of Meursault. It is incredibly soft yet concentrated, diversely flavored wine. This premier cru cn aged 10 -15 years. Famous for their smoky mixture of yellow fruit with more exotic spices and nuts, Pouilly-Fuisse is the appellation for the finest white wines of southern Burgundy's Maconnais district. The wines are known for what's considered to be a smoky essence. Nutty, buttery nuances can also come through. Exotic herbs such as ginger can complement the fruit, mingling with the smoke to create an altogether unusual white wine. Saint-Romain is a small village in the Cote de Beaune sub-region. It is powerful and sophisticated nose, with a hint of nuts, toast and vanilla beans. It s a wine with minerality, an elegant touch of oak, and usually offer a beautiful, long finish. 1. Select the wines & the quantities to purchase among Hospices de Beaune’s 48 cuvées (minimum 12 bottles per cuvée). We will confirm your order after consolidating all of THE WINE CELLAR CLUB collectors’ orders. You will then pay 80% of the total invoice. 2. On November 15th Albert BICHOT & THE WINE CELLAR CLUB will do their utmost to bid & purchase your selected wines at the best possible price. We have set a maximum purchase price beforehand, so you won’t have any surprise. 3. After the auction we will let you know the final auction price and adjust the final invoice. You may choose the size of your bottles: regular bottle (75cl), Magnum (1,5L) or Jeroboam (6L). You may also choose to personalize the wine label and put your name on it. 4. Your wine will then age for the next 14 to 18 months in Albert BICHOT’s wine cellar in Beaune. At any time, you may visit them and taste the wine of your very own barrel.